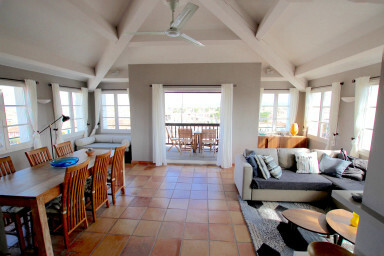 A very spacious apartment, a wonderful view on Port Grimaud and a building with a lift. This 3 bedroom duplex apartment is located halfway between Port Grimaud and Port Grimaud 1. Access is via a lift opening directly to the apartment. On the upper level, a large room bright living room overlooking a large balcony, a separate well equipped kitchen and guest toilet. At the lower level, two bedrooms with a double bed -among which one with a medical bed and its own shower-room, a bedroom with bunk beds (double bed downstairs, single bed on top) with a shower-room and a separate WC. Rooftop solarium and a laundry area. The solarium has a shower and offers a magnificent 360 ° view of Port Grimaud and hills. Super sea view from the balcony and the solarium. A very nice apartment will charm you ! RARE! Suitable for people with reduced mobility.